My potato plants are soo big now. I had to earth them up a bit more again this week. They are almost at the top of my potato planters! I think one more earthing up and they will be full so I will be able to just let them grow and grow. Some of you may remember that I was not able to plant my tomatoes on last week due to not having enough compost left. I kept trying to find some free time to go and buy some more but the time never happened (as is often the case for mothers with young children :P), so I ended up leaving it until this week to plant them on. They were really big and strong. They've grown much quicker than I thought they would! I separated the three seedlings. Make sure to be very careful when doing this as you don't want to rip the roots. I was as careful as I could be but did lose some roots. I just hope there are enough left to keep the plants going because they have been doing so well up until now. A good piece of advice I heard, obviously after I had planted those three together, was to always keep your seeds at a maximum of two per cell, to make it easier to separate when the time comes, and to minimise the risk of transplant shock. I used 30cm pots, one seedling in each pot. I added a couple of pieces of broken brick to the bottom, then a good layer of compost (about halfway up the pot) then a sprinkling of crushed egg shells. 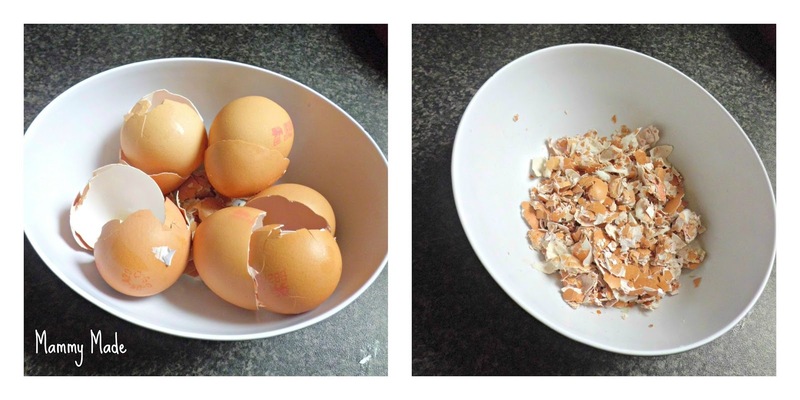 I will add the method for making crushed egg shells at the bottom of this post. I was originally going to buy some crushed oyster shell to add calcium to the tomatoes and therefore reduce the risk of blossom end rot, but looked on the internet and found it is much cheaper to just make your own version! 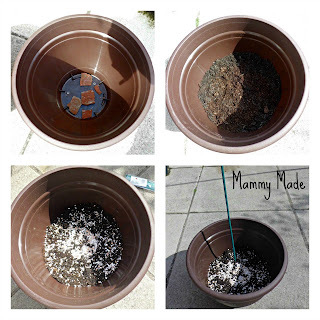 I know some people just scatter broken egg shells over the soil as they use them but this way makes the calcium much easier to break down so the plant can actually get to it. I then added a bamboo cane. It's always better to add the cane at the same time as planting on, because if you add it later on you may damage the roots. Make sure you push it right to the bottom of the pot, to provide stability. I pulled off the first two leaves on the bottom of each seedling. I can't remember where I read this but you bury the seedlings quite deeply, up to the point where the leaves were. This makes the plants much sturdier as they put out roots all the way up the buried stem, therefore giving the plants a better footing, so to speak. They look tiny in their new pots! They will need acclimatising to living outdoors so I will be leaving them outside during the day, but bringing them inside overnight, just for the first two weeks. This helps them a lot to get used to living outside. I was originally going to put them straight in my greenhouse but it is just a light one and has been blown all over the yard in the wind we have had lately, so I don't want to risk it really. My other tomatoes are looking pretty sturdy so will be transplanted into small pots sometime this week. 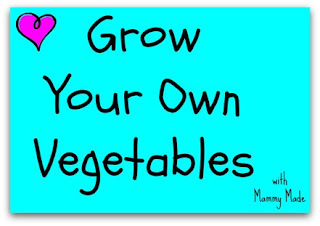 It is really easy to make your own calcium for enriching your plants. This is especially important in containers where the roots can only draw from the nutrients right there in the pot. As I said earlier, I originally planned to buy crushed oyster shell, as I had heard it was really good for adding calcium and therefore reducing the risk of blossom end rot. When I went to buy my compost, I couldn't find any crushed oyster shell and I really didn't have the time to be making more trips than really necessary. I don't have very much time without the kids during the week so when I do have free time I tend to do everything I've been putting off. Obviously I needed to find an homemade way. I googled and found that a lot of people just use chicken egg shells. They need to be dried first and crushed which is very easy to do. Every time I used an egg, I would put the shell into a bowl. I didn't rinse it out or anything, just made sure to get as much of the egg out (make sure no egg yolk is left inside) and then put it straight into the bowl. Leave overnight then crush. You will want to take something flat on the bottom to crush them with. You won't get them too small at first but keep going. Leave again overnight to make sure they are nice and dry throughout. I can't remember where I read this but it is something to do with the membrane. It needs to be dry otherwise the plant won't be able to get the calcium out. You obviously want to get the pieces as small as you can. I actually got them even smaller than in the picture, just by rubbing in my fingers, in much the same way as you would make breadcrumbs. You can see how small the pieces ended up in the tomatoes collage above. You can actually collect egg shells over a period of time and just crush as needed to fit more in. You want to make sure the last eggs to go in the bowl get the full two overnights of drying though.